Do you remember back in January when “Underground Nazi H4ck3rGr0up” hacked UFC.com because the mixed martial arts promotion publicly supported Stop Online Piracy Act (SOPA) and PROTECT IP Act (PIPA), which would have allowed the US Government to shut down Internet websites that provided pirated content? 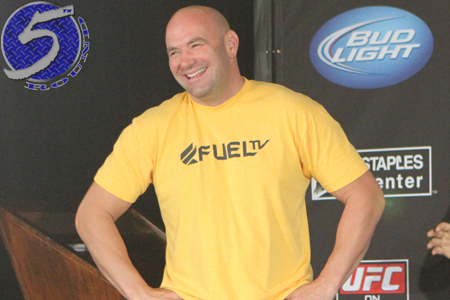 How about when UFC president Dana White (Pictured) taunted and challenged the hackers by claiming he couldn’t have cared less that some keyboard warriors were defacing his company’s website, only to watch the Internet gurus release his personal information shortly after (FYI – some, if not all of the info was inaccurate)? Or better yet, when it was discovered the person spearheading the viral assault was a teenage boy who also helped crack NASDAQ, CIA.gov, Amazon, PayPal and a slew of other mega organizations? Well, according to Wired.com, the 15-year-old plead guilty to multiple felonies in exchange for probation in a juvenile court in Long Beach, CA. He had been charged with credit card fraud, identity theft, bomb threats and online impersonation. His probation period will run until his 21st birthday. During that time, he can’t use the Internet without prior consent from his parole officer. When he does obtain permission, he must be supervised and can only use it for education-related purposes. In addition, he is required to hand over all of his account logins and passwords, disclose in writing any devices that he has access to that have the capability to connect to a network. He is also prohibited from contacting any members or associates of UG Nazi or Anonymous, along with a specified list of other individuals. Finally, he had to forfeit all the computers and other items seized in the raid on his home. Violating any of the terms in his probation will result in a three-year prison term. A teenager unable to freely surf the Internet? Isn’t that like being in jail anyway?